We hung out in the lobby area outside of the hotel restaurant for a little while, and saw Johnson come down for breakfast. 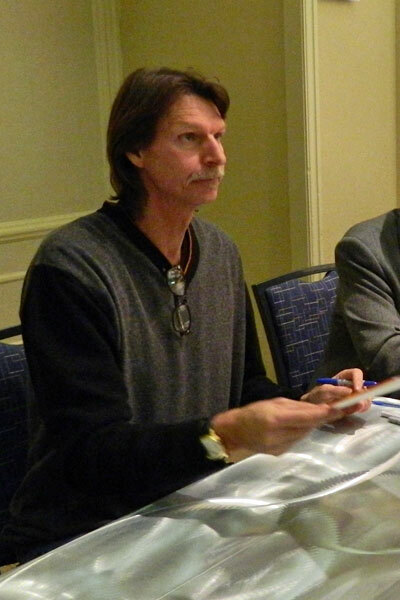 When you see “6-10” written on the back of a baseball card, you know that Randy Johnson is tall – but it didn’t hit home until I saw him in person. Finally, it was time to go back inside the show so Bart could get Pedro’s autograph. The new Hall of Famer had the same outgoing, pleasant demeanor we saw during his Mets career. He posed for photos after signing people’s items until the staff tried to put a stop to that in order to keep the line moving and get everybody through before Pedro had to leave for another event in Connecticut. 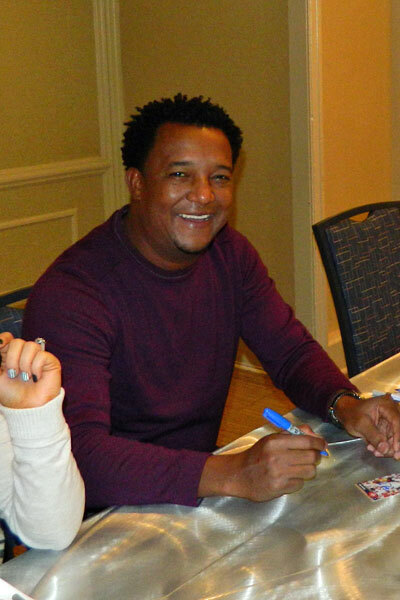 When it got to be Bart’s turn, Pedro took a few moments to reminisce about his July 23, 2000 15-strikeout 1-0 shutout of the Chicago White Sox and smile for a quick photo op with him. Then it was time to wait for almost another hour so he could get Johnson’s autograph. 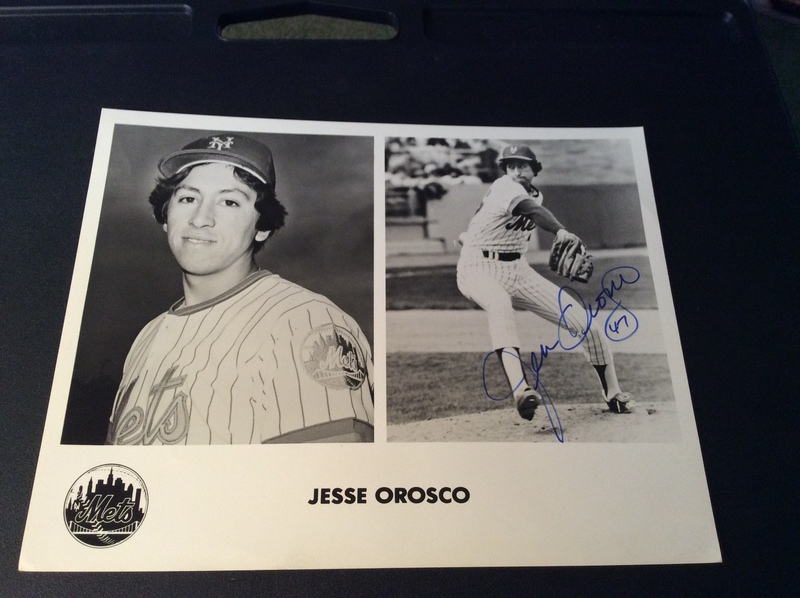 I found a few neat signed photos in another vendor’s bargain box – I got Jesse Orosco, Mike Pelfrey and Todd Pratt for $5 each. Johnson was courteous enough, but not outgoing like Pedro. And unfortunately, even in a paid signing, he seemed to have a knack for putting his autograph in the worst possible place on a photo. Kudos to the MAB staff for making sure their customers left happy – they got Bart another copy of the photo he’d bought and had Johnson re-sign it, and I know they did the same thing for at least one other person. The autograph prices were a bit too steep for me – Pedro’s autograph tickets started at $159, while Johnson’s started at $199. (Fortunately, I already had Pedro’s signature – obtained for a somewhat lower price a few years ago.) But it was still fun to see them and spend part of the day hanging out with my friend. 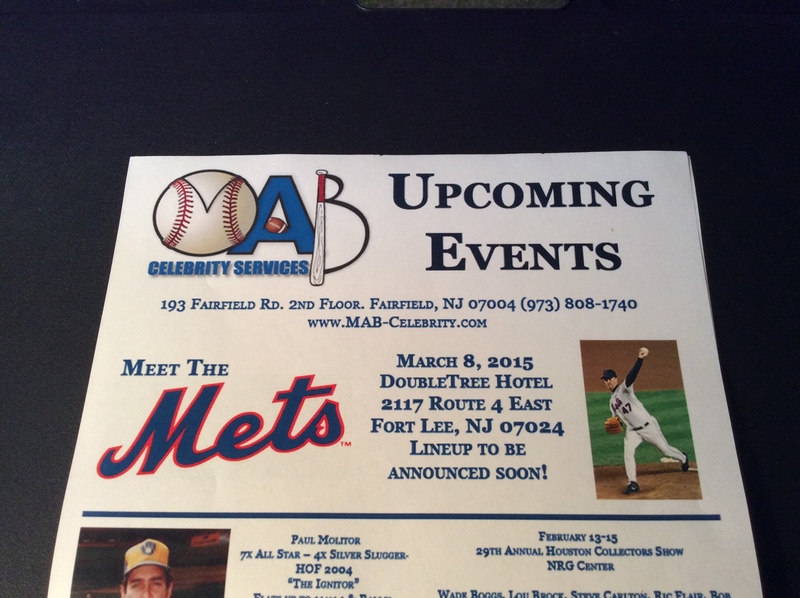 Mets fans may want to take note of MAB Celebrity Services’ planned autograph show on March 8 in Fort Lee. 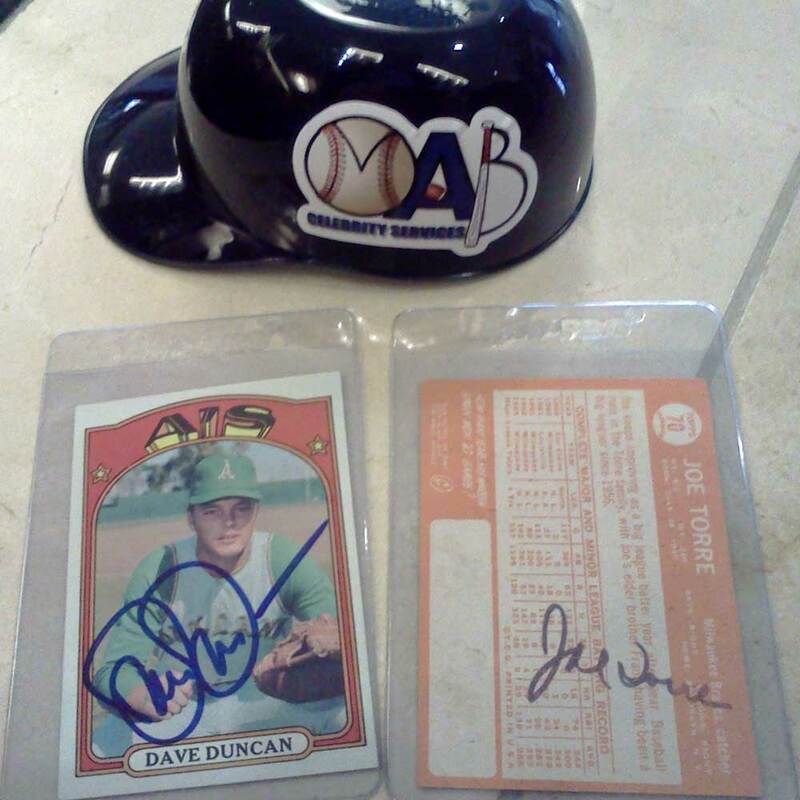 Watch their website for further details as they announce an autograph guest lineup. Next Post Who needs football? You can meet two former Mets on Sunday! Did Tino end up making it? I’m not really sure – he was on the schedule for today, but I only went yesterday.